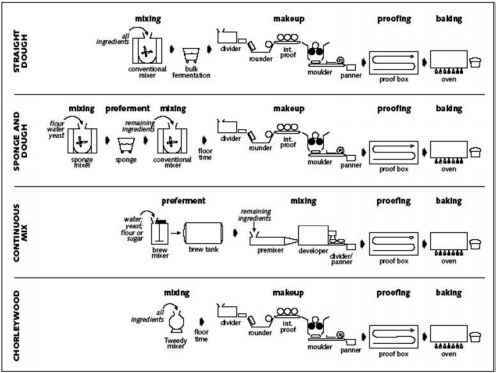 In the United Kingdom, the Chorleywood process is also a rapid, high throughput method and is probably the main commercial system for bread manufacture (Figure 8-9). It is little used, however, in the United States. This is a no-time process in which rapid mixing is a critical feature. Whatever fermentation there is, prior to the final proof, occurs during the brief floor time (at temperatures near 40°C).Thus,the start-to-finish process takes only two hours. Most yeast breads have a slightly acidic pH, due, in part, to acids produced by the yeast and, to a lesser extent, to dissolved CO2 in the dough. In addition, acids also are produced by lactic acid bacteria that ordinarily are present in the flour, in the yeast preparations, or that simply naturally contaminate the dough. However, the presence of endogenous lactic acid bacteria has, under most circumstances, only a modest effect on dough and bread acidity. The perception of sourness for most consumers does not occur unless the pH is near 4.0, which is far lower than the normal pH range of 5.0 to 6.0 for most yeast breads. However, if lactic acid bacteria are deliberately added and allowed to grow, enough acids can be produced to lower the pH to below 4.0 and to cause a distinct sour but appealing flavor. Not only do these breads have a unique flavor, but they are also better preserved due to their high acidity and low pH. In fact, there are several functional advantages to the sourdough fermentation, particularly for breads made from rye and other flours (Box 8-4). Although a desirable sour flavor is likely the most noticeable property of sourdough breads, the use of sourdough cultures in bread manufacture offers other important advantages (Thiele et al.,2004;Table 1). Arguably,the most important benefit of the sourdough fermentation is due to the organic acids that are produced by the sourdough bacteria and the ensuing low pH that results in enhanced preservation and increased shelf-life of sour dough breads. However, the sourdough fermentation also has a major impact on dough functionality, in particular, when rye or other whole grain flours are used as an ingredient. Table 1. Functional advantages of sourdough cultures. Messens and De Vuyst, 2002. Collar Esteve et al., 1994. Di Cagno et al., 2004. Next to wheat, rye is the second most common cereal grain used to make bread. Rye, however, has properties that pose particular challenges when used in bread making. First, rye contains a high concentration of pentosans, a heterogenous mixture of pentose-containing poly-saccharides consisting mostly of xylose and arabinose. They constitute as much as 10% of rye flour, which is four to five times more than that found in wheat. In bread making, the pentosans may have both positive and negative effects. For example, pentosans have high water-binding capacity and may,therefore, decrease retrogradation and delay staling. On the other hand, pentosans may interfere with gluten formation, giving an inelastic dough that retains gas poorly. Perhaps the major problem with rye is that the rye proteins do not form a viscoelastic dough.As a result, breads made with rye as the main grain typically have a small loaf volume and a dense crumb texture. In addition, rye flour contains more a-amylase than is present in wheat, and this amylase is particularly active at the temperature at which starch gelatinizes.This results in excessive starch hydrolysis in the dough and bread, giving a poor texture and further reducing loaf volume. ticity and gas retention. In other words, at low pH, the pentosans assume the role normally performed by gluten. In addition, the sourdough organisms are stimulated in rye flours by the availability of free sugars liberated from starch via the a-amylase. Moreover, this enzyme begins to lose activity at the low pHs achieved during the sourdough fermentation, so excessive hydrolysis is avoided. Some sourdough bacteria also have the ability to ferment pentoses released from pentosans, producing heterofermentative end products, including acetic acid (Gobbetti et al., 2000). Finally, the subsequent acidic conditions enhance the water-binding capacity of the starch granules, which further decreases the rate at which staling occurs. Another potential problem in breads made from rye and other whole grain flours is due to the presence of phytic acid. Phytic acid (also called myoinositol hexaphosphate) is a highly phosphorylated, negatively charged molecule that is capable of binding zinc, iron, calcium, and other divalent metal cations, preventing their absorption. Thus, phytic acid, by reducing the bioavailability of essential minerals, has "anti-nutritional"properties. Cereal grains can contain as much as 4% phytic acid, and although levels in whole grain bread are usually less than 0.2%, this is still enough to be a nutritional concern. Degradation of phytic acid in bread ordinarily occurs via the enzyme phytase, which is present in flour and is also produced by yeasts. Recently, it has been shown that Lactobacillus san-franciscensis, Lactobacillus plantarum, and other sourdough bacteria also produce this enzyme (De Angelis et al.,2003;Lopez et al., 2000). Moreover, phytase activity, and in particular, the phytase produced by L. sanfranciscensis, has an optima at low pH (pH 4 in the case of L. san-franciscensis). Thus, the sourdough fermentation also enhances the nutritional quality of rye and other whole grain breads. Armero, E., and C. Collar. 1998. Crumb firming kinetics of wheat bread with anti-staling additives. J. Cereal Sci. 28:165-174. Collar Esteve, C., C. Benetido de Barber, and M. Martinez-Anaya. 1994.Microbial sour doughs influence acidification properties and breadmaking potential of wheat dough.J. Food Sci. 59:629-633,674. De Angelis, M., G. Gallo, M.R. Corbo, P.L.H. McSweeney, M. Faccia, M. Giovine, and M. Gobbetti. 2003. Phytase activity in sourdough lactic acid bacteria: purification and characterization of a phytase from Lacto-bacillus sanfranciscensis CB1. Int.J. Food Microbiol. 87:259-270. Di Cagno, R., M. De Angelis, S.Auricchio, L. Greco, C. Clarke, M. De Vincenzi, C. Giovannini, M. D'Archivio, F. Landolfo, G. Parrilli, F. Minervini, E.Arendt, and M. Gobbetti. 2004. Sourdough bread made from wheat and nontoxic flours and started with selected lactobacilli is tolerated in celiac sprue patients.Appl. Environ. Microbiol. 70:1088-1096. Ganzle, M.G., and R.F.Vogel. 2003. Contribution of reutericylin production to the stable persistence of Lactobacillus reuteri in an industrial sourdough fermentation. Int.J. Food Microbiol. 80:31-45. Gobbetti, M., P. Lavermicocca, F. Minervini, M. De Angelis, and A. Corsetti. 2000.Arabinose fermentation by Lactobacillus plantarum in sourdough with added pentosans and a-L-arabinofuranosidase: a tool to increase the production of acetic acid. J.Appl. Microbiol. 88:317-324. Korakli, M.,A. Rossmann, M.G. Ganzle, and R.F.Vogel. 2001. Sucrose metabolism and exopolysaccharide production in wheat and rye sourdoughs by Lactobacillus sanfranciscensis.J.Agric.Food Chem. 49:51945200. Liljeberg, H.G.M., and I.M.E. Bjorck. 1996. Delayed gastric emptying rate as a potential mechanism for lowered glycemia after eating sourdough bread: studies in humans and rats using test products with added organic acids or an organic salt.Am.J. Clin. Nutr. 64:886-893. Lopez, H.W.,V Duclos, C. Coudray,V Krespine, C. Feillet-Coudray,A. Messager, C. Demigne, and C. Remesy. 2003. Making bread with sourdough improves mineral availability from reconstituted whole wheat flour in rats. Nutrition 19:524-530. Lopez, H.W.,A. Ouvry, E. Bervas, C. Guy,A. Messager, C. Demigne, and C. Remsey. 2000. Strains of lactic acid bacteria isolated from sour doughs degrade phytic acid and improve calcium and magnesium solubility from whole wheat flour. J.Agric. Food Chem. 48:2281-2285. Messens W., and L. De Vuyst. 2002. Inhibitory substances produced by Lactobacilli from sour doughs—a review. Int. J. Food Microbiol. 72:31-43. Thiele, C., M. G. Ganzle, and R.F. Vogel. 2002. Contribution of sourdough lactobacilli, yeast, and cereal enzymes to the generation of amino acids in dough relevant for bread flavor. Cereal Chem. 79:45-51. Thiele, C., S. Grassl, and M. Ganzle. 2004. Gluten hydrolysis and depolymerization during sourdough fermentation. J.Agric. Food Chem. 52:1307-1314.
been made for many years. In fact, it seems likely that the very first breads made thousands of years ago were sourdough breads. Until the advent and availability of bakers' yeast cultures just a century ago, it also is probable that sourdough breads were the main type of bread consumed throughout Europe and North America. This is because doughs were naturally fermented by wild cultures, which inevitably contained lactic acid bacteria, including heterofer-mentative strains that could produce sufficient CO2 to cause the dough to rise. In addition, most wild sourdough cultures also contained wild yeasts that would further contribute to the leavening process (see below). These mixed bacteria-yeast wild type cultures could easily be maintained and used for many years, if not decades. bacillus culture used in European sourdough breads. In addition to having isolated L. sanfrancis-censis from sourdoughs, the same USDA researchers discovered that the sourdough sponge also contained a unique yeast strain. This strain was identified as Torulopsis holmii (the imperfect form of a Saccha-romyces species that was once classified as Saccharomyces exiguus), and was later reclassified as Candida milleri. This yeast was found in other L. sanfranciscensis-containing sourdough sponges from the local area, and always in a yeast:bacteria ratio of about 1:100. The same yeast-bacteria duo has subsequently been found in sourdoughs from around the world.That these organisms are found consistently in sourdough breads from such distant geographical locations reflects their remarkable adaptation to the dough environment (Box 8-5). This also accounts for the durability and stability of sourdough sponges, some of which have reportedly been carried for more than 100 years. Almost all wild sourdough cultures, especially those that have been maintained for a long time, contain both lactic acid bacteria and yeasts. Although many species of lactic acid bacteria and yeast have been isolated from sourdoughs, the most common appear to be Lactobacillus san-franciscensis (formerly Lactobacillus sanfrancisco) and Candida milleri (Kline and Sugihara, 1971 and Sugihara et al., 1971). It is remarkable that the interaction between these organisms is not only stable, but that both organisms derive benefit from this unique ecological association. Moreover, despite their saccharolytic and fermentative metabolism, these organisms appear to observe a non-compete clause, and instead share the available sugars present in the dough. Several physiological and biochemical properties are now known to be responsible for the stable, symbiotic relationship between L. sanfranciscensis and C. milleri and their ability to grow together in bread dough. First, L. sanfranciscensis is heterofermentative, producing acetic and lactic acids, ethanol, and CO2.The pH of the dough can drop to as low as 3.5,a pH that is inhibitory to competing organisms, including bakers' yeast strains of Saccharomyces cerevisiae. In contrast, C. milleri (and related species) is acid-tolerant and benefits by the lack of competition from other acid-sensitive yeasts.The yeast, in turn, releases free amino acids and other nutrients needed by the Lactobacillus. There is also a fascinating metabolic component to the L. sanfranciscensis-C. milleri symbiotic partnership. Most of the fermentable carbohydrate found in sourdough is in the form of maltose.Whereas S. cerevisiae, the ordinary bakers' yeast, readily ferments maltose, C. milleri is unable to ferment this sugar, leaving this organism without an obvious substrate for growth. In contrast, L. sanfranciscensis not only prefers maltose as a carbohydrate source, but ferments this sugar in a particularly relevant manner. Ordinarily, one might expect that metabolism of the disaccharide maltose would result in both glucose moieties being fermented. However, when L. sanfranciscensis grows on maltose it uses the cytoplasmic enzyme maltose phosphorylase to hydrolyze accumulated maltose, yielding free glucose and glucose-1-phosphate. The latter is isomerized to glucose-6-phosphate, which then feeds directly into the heterofermentative phosphoketolase pathway (Chapter 2). The glucose generated by the reaction is not further metabolized, but rather is released into the extracellular medium, or in this case, the dough. Glucose excretion occurs, in part, because maltose is transported and hydrolyzed so rapidly that more glucose is formed than the cell can handle (Neubauer et al., 1994). Weak expression of hexokinase also contributes to slow glucose use.The net effect of this unique metabolic situation is that maltose is available for the sourdough bacteria, glucose is available for the sourdough yeast, and neither organism competes against each other for fermentation substrates. Gobbetti, M., 1998.The sourdough microflora: interactions of lactic acid bacteria and yeasts.Trends Food Sci.Technol. 9:267-274. Kline, L., and T.F. Sugihara. 1971. Microorganisms of the San Francisco sour dough bread process. II. Isolation and characterization of undescribed bacterial species responsible for the souring activity. Appl. Microbiol. 21:459-465. Neubauer, H., E. Glaasker,W.P. Hammes, B. Poolman, and W.N. Konings. 1994.Mechanisms of maltose uptake and glucose excretion in Lactobacillus sanfrancisco. J. Bacteriol. 176:3007-3012. Sugihara, T.F., L. Kline, and M.W. Miller. 1971. Microorganisms of the San Francisco sour dough bread process. I.Yeasts responsible for the leavening action.Appl. Microbiol. 21:456-458. Table 8.4. Microorganisms isolated from sourdoughs1.